This option is not enabled by default for existing users. Quoted user is only alerted if they are a "top level quote," meaning, if the post directly quotes them and not indirectly, like where a quote has multiple quotes within itself. This prevents useless alerts that aren't really relevant to the user in question. 2. New settings page in profile. This basically controls some of the features I have added, and adds some new ones. The idea behind this is relatively straightforward - You click a little search/magnifying glass icon-button next to a user's post in a thread (where the profile stuff is), and it will bring up the same thread in a new window, except the only posts you see will be the selected user's posts. 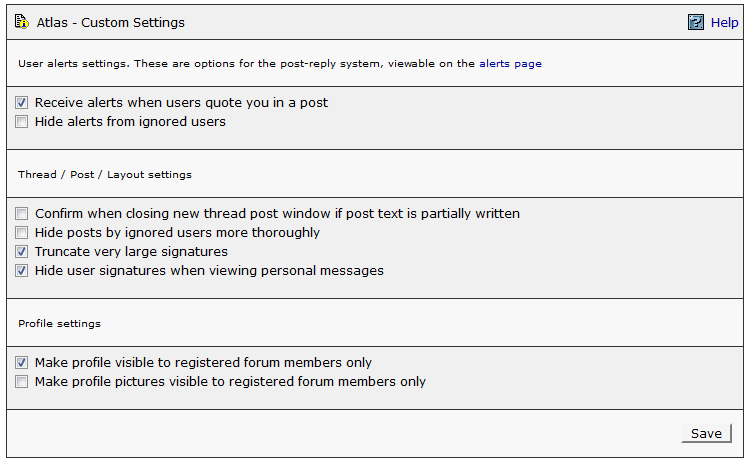 This is a quick and easy way to see everything a user has posted in a specific thread. I added this because it was incredibly easy, especially given the way SMF structured their new post page. 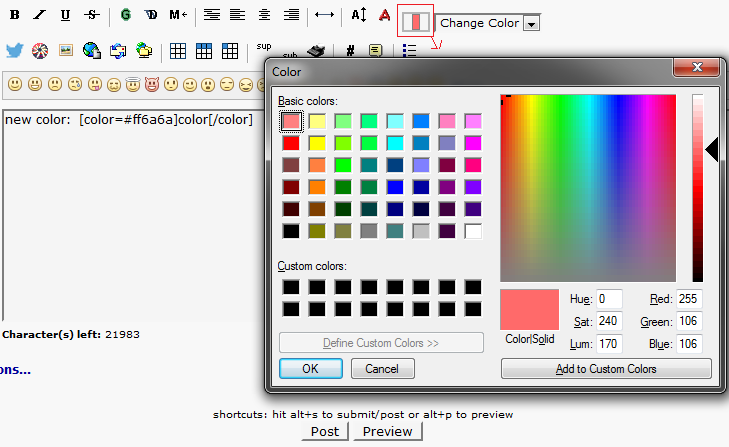 It allows a user to select a [color] tag that is not bound to the limited list of colors presented in the dropdown list. This allows a user to select any color from the full RGB range using a custom color picker window. Note that this option only works in Firefox and Chrome, and in IE the color button won't be visible. It should also be noted that this functionality already exists, in that you can do [color=#htmlcode], but this modification gives the user an expanded color picker window for easy use. Big signatures are partially hidden. The maximum size of a signature before it gets hidden is not set in stone, and hopefully within a week we can come to an agreement on how big the limit should be. Once you click the Show button, it reveals the whole thing. 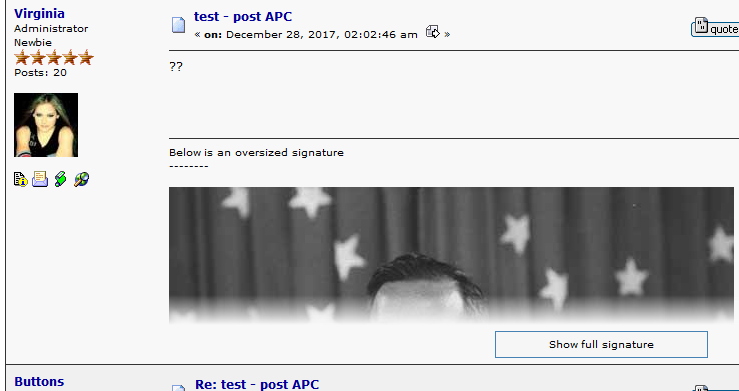 Note that the size of the visible part of the signature is not the hardcoded limit I set, it's just the amount that will be shown once a signature is determined to be too big. Also, this option will not be set by default for either existing or new users. People will have to turn it on manually. The overall feature list may seem kind of slim, but that is because I started this project early last year with no knowledge if it would be implemented or not, and my initial focus was just on fixing a few problems with the Moderator tools. However I kept adding new things, and so this is where it ended. Dave said he was open to a 2nd version with even more features, so I plan on soliciting ideas from everyone on what to add. Please keep in mind that there might still be some bugs that need to be worked out, so if you experience any issues that haven't occurred before, please report it in this thread and/or to me personally. The new Forum is too wide. Please reduce the size. It's like an overweight fatass now. I'm getting a headache trying to read and view the forum. Ugh. When do they happen (exactly)? Can you describe the error? Edit: Actually I think I know what it is. Working on it now. This. Thanks, Virginia, this seems like hard work! "Character(s) left" count is a bit distracting but maybe I'll get used to it. Awesome! I found the new options on the profile page. Okay, so now can we get our "nationalist" avatars? Please remove the emotes in the post window, and the commas in post counts. They are bothering me for some reason. Wasn't your account supposed to be deleted in the update? I'm sure it's in the works. I like the fact we canchoose our color to post in and use any emoji we want when posting with ease now. I might add a profile option to disable the emoji bar. I could have sworn I did that already, but I think it removed it thinking no one would use it. The number someone's posts is now separated by a comma now!!! I don't even remember adding that tbh. I wonder if Dave did that. That is the worst part. It has been driving me nuts today. Big numbers can be read way more easily when big numbers are divided. It's just a bit hard to get used to the comma, which you anglophones use instead of a dot. Hate the auto sad smiley (as now that means if I have an extra space between a colon and bold it will come up , or want to use parentheses next to a colon. I would also be very interested in an avatar update (nationalist avatars + more countries, I believe there are threads on The Atlas where they have already been posted) and a country flags update (some of these flags, such as the Georgian one, haven't been in use for over 10 years).